This book presents the Tarot as a form of ancient, magic knowledge which is in harmony with Christian tradition and the symbolism of the New Testament. It describes cards as visual representation of the hermetic worldview. It explains the dual structure of The Major Arcana, described by Paul Christian, but the meaning behind this was not commented on at all. The magic connections discussed in the book relies on the work of the magician Franz Bardon, and it is of paramount importance for all of mankind. The figure below demonstrates the dual structure of The Major Arcana, which was first published by Jean-Baptiste Pitois, under the name Paul Christian, in the novel L'homme rouge des Tuilereies (1863), based on old documents, which have been found in a library. These paintings of Major Arcana were displayed in an ancient Egyptian gallery, arranged in pairs (the dual arrangement), so that the last picture was opposite the first, the next to last picture opposite the second and so on. Later, this arrangement of pictures was analyzed by well-known experts: Papus and Oswald Wirth. The problem with this arrangement is the incorrect placement of The Fool, the card without number, since its meaning is ungraspable in the material world. Its essence was not fully part of the created world; its essence has remained on the side of uncreated, non-existent in the world. From the primordial energy, represented by the Arcanum Fool, all the other dimensions of the world were created. That is why the duality of The Fool and the duality of the material world a primordial duality. This is explained in more detail by next 10 dualities of other cards. 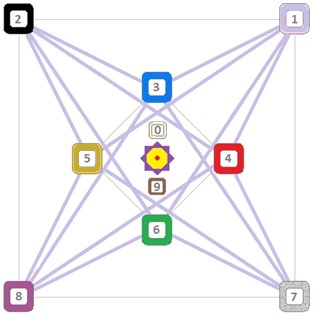 The figure below shows the correct dual structure of The Major Arcana (0-21, 1-20,..., 10-11). The Magician represents the creative energy through four elements when the spirit manifests itself in the created world, matter and life. However, the Arcanum Judgement represents the inverse spiritual resurrection, when the material world transforms into spiritual. The path of the magician creates the duality with the spiritual resurrection of creation, which represent the Arcanum Judgement (AEON). The Arcanum Priestess holds the key to wisdom, and represents the invisible finely the material world. For the magician reveals the duality of different spheres (dimensions), where exist both positive and negative beings. Nevertheless The Arcanum Sun represents the light of God and the children's joy, where everyone loses duality, because the darkness is only a lack of light, so the world of duality not actually exist. The King Arcanum embodies the principle of the laws of wisdom, power and justice. In contrast stands the Stars that brings undeserved kindness and innocence, of which the law has no power. The High Priest is a public teacher of God's mysteries. In contrast stands tower, which reveals that God's law can not be used to build a hierarchy in society, as it happened at the Tower of Babel. The God wants to stay hidden and only a personal journey can be approached him. Love is a guarantee of the spiritual unification and free beings. In contrast stands Satan Arcanum, where everything is for him only a pact, well thought out trade without emotion. Inevitably arises enforcement of superiority and inferiority in the name of justice and power. Expressions of undeserved kindness is only weakness and failure to justice. The Chariot of victory is a force that affects in decisive moments. Tarot is not by chance has name of triumphs. Compared to this power stands Arcanum Temperance. The role of temperance is to prepare the world for the coming big changes. The Temperance hold back the Chariot and ensure that the world was ready for these changes, and everyone can take their own stance. It can clearly see that the duality is not some middle ground where Temperance mentioning the strength of Chariot, but vice versa. In this duality Chariot and Temperance both full force perform their mission. The Arcanum Justice ensures that everyone gets their deserved reward, as we read in fairy tales; balances the scales. In contrast stands Arcanum Death which ends all the time, sealed, pick up the fruits of life, he shall harvest. The final adjudication of justice without sealing the events would be impossible because man is also at the last minute can change. In the book of Revelation, therefore, we see the opening of the seven seals. However Arcanum is justice and harmony that can equalize the scales (karma), and revive what has been destroyed or killed, it is no in time. 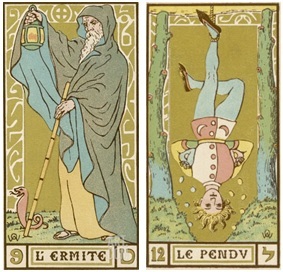 The path of the old Hermit is in contrast to the young hanged man, who thinks he came to the great knowledge, because they attach themselves to some ideas, but they do not realize that it can not carry out any practical change. In the character of hanged man we see self-sacrificing people who are in the impression of universal love were keen descendants esoteric or religious ideas, but no practical experience of losing solid ground under their feet. Right wisdom is primarily practical knowledge of forces and hard work towards enriching their own personality, and not merely a passive acceptance of some beautiful idea or religion. The Wheel of Fortune (samsara, reincarnation) can ascend to a higher level using only magic power, which represents the Arcanum Strength. 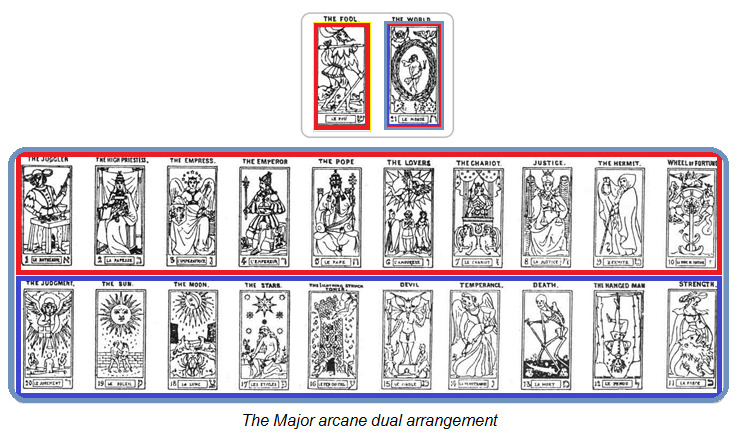 From the dual arrangement we can move on three-columns arrangement of the Major Arcana. 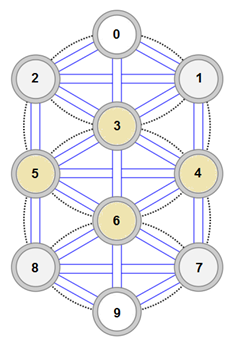 The figure shows only 10 centers, since each number belongs to one of duality. For example, the number 3 corresponds to the duality of cards Queen and Moon. The duality of Wheel (X) and the Strength (XI.) is not shown in the figure because it represents the next level, which in turn displays the entire three-columns arrangement layout of 10 pro-ideas. The figure must not be confused with the kabbalistic Tree of Life, because in this context has a completely different meaning. Relationship tarot and kabbalah is explained in detail in the book under the title: "The upper and lower world." For dual and three-columns arrangement we can move to a square arrangement of the Major Arcana. Meaning square arrangement is known as the so-called "Court cards". Traditionally, the tabs are named as King, Queen, Knight and Page (servant) in the colors of four elements together 16 cards. The King represents the role of the reign. The Queen represents role of providence and care, the Knight self-realization and the Paga represents the service of fulfillment of destiny. The name of "Court cards" is not random, because it indicates that these cards are something in the yard, for example, some of the palace. The sanctuary or palace stands in the center of the entire course layout, where all can reunite. This is the main secret of Court cards, because courtly cards convey the essence of God's name, 4x4 faces of the cherubim around the throne of God (cf. the book of Ezekiel chapter 1). Court cards generate 16 links around palace. 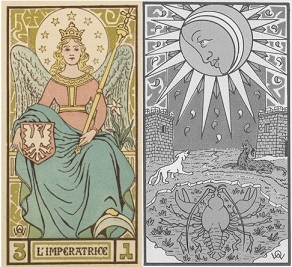 This image compare of the 3th Tarot card by Franz Bardon! A more detailed explanation can be found in the book. Aleister Crowley's Tarot: Knight, Queen, Prince, Princess, use names that correspond to the King, Queen, Knight, Page traditional names. Is obvious from his names of "Court cards" and his characteristic of cards, he did not know secret of "Court cards". From three-columns arrangement, we can deduce the arrangement, which can be represented as a five-pointed star. Simply understood that this arrangement creates new duality: 0-9, 1-8, 2-7, 3-6, 4-5. Total are 5 duality. 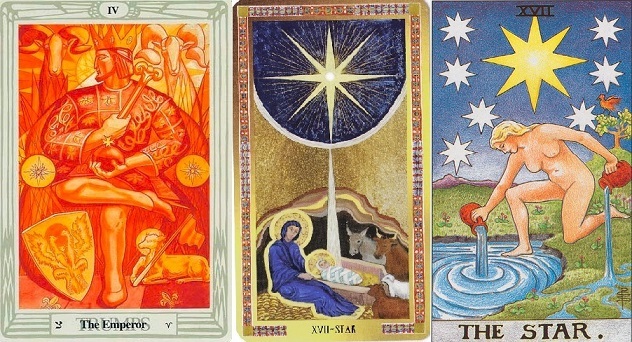 This arrangement of the Major Arcana (five-pointed star) is in analogy with the card King (IV.) The square arrangement was in analogy with the card Queen (III. ), and three-columns arrangement with a card Priestess (II.). Similarly, it is possible to derive and other arrangements that always reflect other secrets hidden in the Tarot. The dual arrangement is therefore a first key to understanding figurative symbolism of the Tarot. The structure of the Tarot everything comes from out perfect unity. Perfect unity is manifested in the created world as a primary duality. It is no coincidence that we see duality in life at every step, as the symmetry of right and left sides, or as symmetry of what is up and down. Tarot consists of 78 cards, but why just 78? To answer this question we need to examine in more detail the structure of the Tarot. Major Arcana consists of primordial duality that manifests itself in ten duality. Thus the Major Arcana has 22 cards together. The Minor Arcana it is arranged on the basis of four elements. The "Court cards" from Minor Arcana have a secret relationship with a primary duality, because "Court cards" given numbered cards Minor Arcana arranged by four elements of 10 cards. 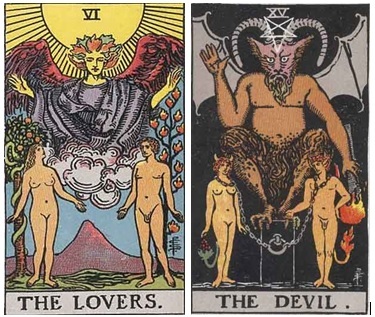 The numbered cards of Minor Arcana show that ten is the basis for understanding of the nature, therefore the old masters did not created numbered card of Minor Arcana as 4x22, but 4x10. The Tarot using traditional figurative symbolism can explain himself, although pictorial symbolism during the period undoubtedly received European form. To the surprise name TAROT (TA-AR-OT) is precisely derivable from the Hungarian language, and indicates a person (spirit), who expands (poured out his spirit) and opens his secrets at all time. Franz Bardon (1905 - 1958) was hermetic magic of Moravian origin, giving a completely different perspective on the tarot. He wrote three books about the first three cards of the tarot. He connected Magician Arcanum with the magic of four elements. The High Priestess Arcanum connected with the evocation magic, and the Queen Arcanum with the true kabbalah. After his death, his books have been translated into many languages with remarkable success.